Theme: Clever iron tote and pressing pad in one. 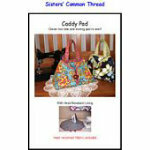 Super cute and comes with heat resistant fabric to make,one Caddy Pad. A pattern plus. Sized for a full size iron. Great class project.